To permanently transform your negative attitude into one that overflows with patience, love and kindness, be certain you read The Attitude Antidote: A Whole Life Overhaul 21-Day Devotional. Attitude is a way of thinking and behaving that gets set into motion by letting things bother you. I hate to say it, but it really comes down to perspective. What is this a photo of? If your first instinct was a negative one, like, “Oh, there’s water missing, ” you, my friend, likely struggle with looking at things in a positive light. Often time, that can be me. Instinctively, I feel there is something wrong when I look at the photo. I don’t think it’s necessarily a bad thing, just a fact of who I am. So that means that one of my challenges in life is to focus on seeing things a bit different than my initial reaction. That’s okay though. Everyone has struggles. Everyone has things to work on. Everyone is put on this earth to learn different lessons. 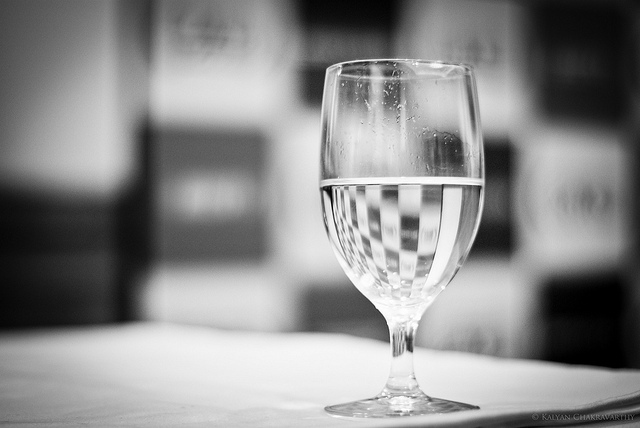 Just because a glass half full attitude may not come natural, doesn’t mean that is a lost cause. 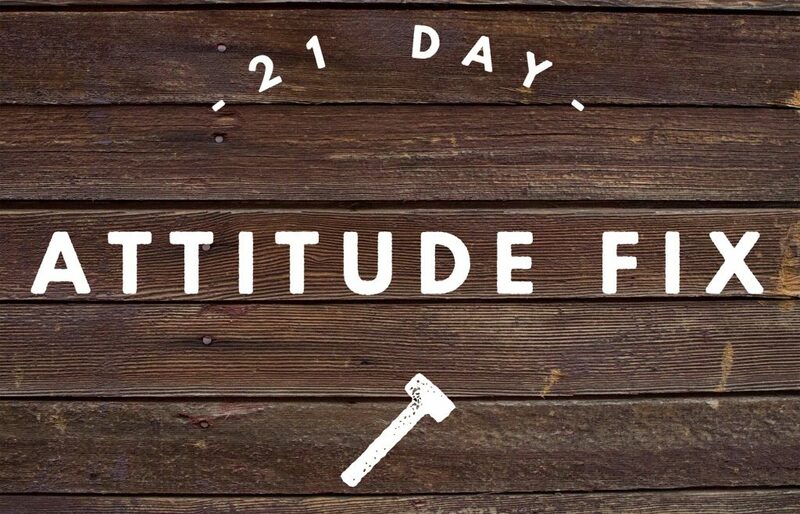 Once I completed the 21-day attitude fix, I really saw a change in my gut reactions, permanently. In turn, conflict was, and remains, reduced. Making personal changes to your soul involves something spiritual, weather you believe in God or not. You don’t necessarily need to be a Christian to complete this, but it certainly helps. This program is effective because it is focused on unconditional love and patience, so naturally it involves some teachings from the Bible. Start your mornings slowly. Get up early every morning of this process so you may have solitude and peace during this process. Get up before your kids, family, etc; give yourself a solid 15 minutes alone. You must begin your day with these exercises to place your whole body, mind and soul into the right state of mind. It will not work at the end of the day, I promise. Dedicate yourself to do this daily (or at least 6 days a week) for the fix. Get a new journal to use through this process. You will want to revisit your notes, thoughts and personal assignments once it’s over for continued reminders and boosts. Remember to number your days at the top or bottom of the page, it’s interesting to see thought processes at certain points throughout this journey. When I dedicated myself to this process, I personally needed a daily reminder that surpassed my alone time in the morning. Do you remember the w.w.j.d. bracelets? Well, I recreated the same type of idea with a few natural stone bracelets. (See day 8 for details.) You may find that another trick works for you. Whatever it is, something on your person is a good idea, so it’s always staring you in the face, reminding you of your commitment to have a better, positive attitude and to to be a better person to others in your life. Prepare for life after the fix. 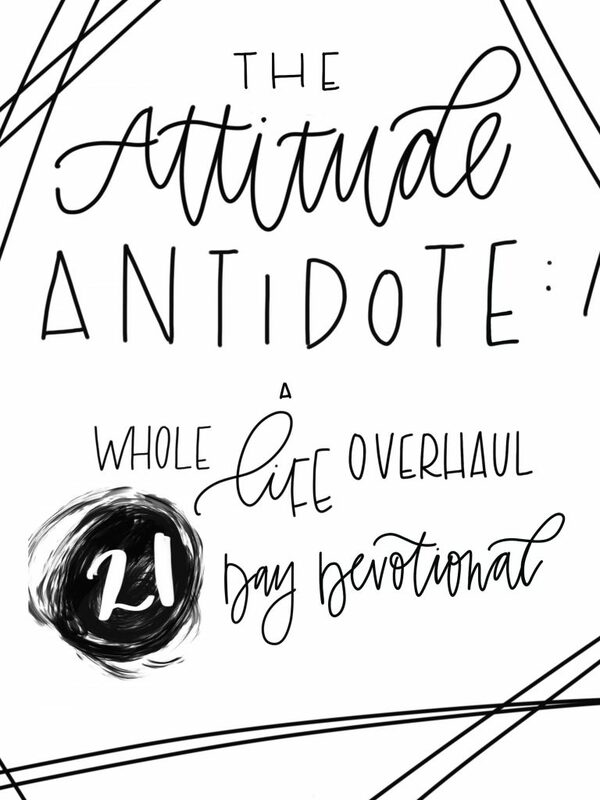 The Attitude Antidote: A Whole Life Overhaul 21-Day Devotional is the perfect follow-up to this program. It will transform your life and relationships through character enrichment. You will start seeing life—and reacting to it—with a new perspective. The intention is for you to increase your self-control, to discover joy and hope, to deal with past hurts and resentments, and to refocus your life on what really matters—ultimately inviting God to revamp your attitude and yourself from the inside out. I will change my negative, condescending attitude. Make the above a daily prayer or mantra. Think about who in your life you are the most negative and judgmental towards. How have you brought them down? Then imagine how they would feel if you built them up vs. tearing them down. Put yourself in their shoes and think about how you’d like to be treated by them, then imagine yourself doing just that. Act out a play in your head to practice for real life. Forgive yourself. Everyone has struggles. This is yours. The most important part of this is realization and your readiness to change. If you’re reading this and thinking of doing it, you’re on the right path. Forgive others. Let the one you’ve been critical towards know that you’re sorry and are working on being a more positive person. Prayer: Forgive me for being negative, quick to anger, unforgiving, disrespectful and prideful. When a tough situation arises and you feel yourself becoming too overwhelmed with negativity and anger, step back and reflect first. Slow down! Don’t let yourself go from 0-100 (that’s your goal). It is often helpful to remember your ultimate goal with the person you’re getting upset with. If it’s a spouse, the ultimate goal is to stay together and be happy. If it’s family, the ultimate goal is to stay in a good relationship with them. Boss? The goal there is to eliminate resentment and keep your job. Whichever situation is yours, it likely involves being in a good relationship and remaining happy. The bottom line then is to take steps to attain the goal and not allow daily struggles to get in the way of that. Ask yourself, “What is positive here?” Or focus on a good thing about that person vs. the negative one in your head. 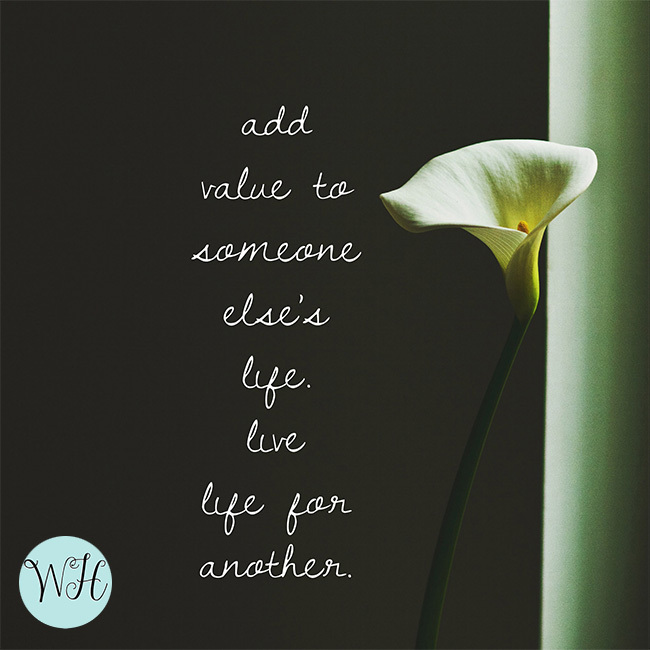 Add value to someone else’s life. LIVE LIFE FOR ANOTHER. Is this situation so distressing that it needs to be addressed? I once read a suggestion to wait an entire three days before addressing an issue to be sure it’s really worth it. Personally, I think that’s a bit extreme, but I like the principal. Don’t be so reactive. Wait and cool off prior to saying what’s on your mind. When I employ this tactic, I typically find out most things aren’t worth the fight. Daily Mantra: I can control my life through controlling my emotions and attitude. True love is not selfish. If we lose patience, get angry or harsh, it’s usually because we have begun to put ourselves first. Put up with some sh*t from the ones you love – sorry to say, but this world has gotten us accustomed to believing we should always be happy at whatever cost. If you want happy relationships, you must live life for another, not yourself. Only respond in love. Step away, hold your tongue until you can respond lovingly. Think about times when your patience string gets small. For me, it’s when I’m rushing or tired. Transition times are often stressing too, like getting ready to go somewhere or for bed. Start early and avoid rushing. Allow plenty of time to do what you need to do. This will give your patience a boost. Remember: Be like Jello and absorb crazy emotions (like from a toddler and a stressed husband). Then filter those emotions through prayer. You need to be the strong emotional backbone of your family or circle. Someone has to do it. This morning, BE STILL. Close your eyes and think of healing waters flowing next to you, overcoming your thoughts and emotions. Let that water wash away all your hurt and hardness. Let go of your anxieties and cares. Now, think about the following question. What are you hearing in the peacefulness of your morning? Listen for an answer. Clear your mind of any thoughts. What is God saying to you? Write it down! Even if it’s just a word, write it down. A song kept flooding my mind this day, so I listened to it and really read into the lyrics. Answers can come in many forms – just listen. Imagine and play out in your head how you will implement these practices today and this week. By now, you may be feeling stronger in your positive feelings. If this is your case, awesome. If not, DON’T GIVE UP! I had the opposite happen to me. I felt as if things were getting HARDER! In most big life changes, the universe (weather that be God or some other force) will throw all there is at you to inhibit the change. PUSH THROUGH, because after the hardest part, there is a great breakthrough and then it gets easier. Literally, on day 7, I wrote, “It’s getting more difficult. Am I going backward? Yes. I’m crumbling.” You’re not alone if you feel this way. I can attest to that. If you’re being broken down, that’s actually a good thing! Let yourself be ripped down and be rebuilt. God is in control of this and it is a necessary evil of change. You must be broken to be made whole. After my breakdown, I felt as if I needed a daily reminder to keep me going in this difficult transformation. As mentioned above, I researched natural gemstones and decided on three bracelets to aid my process. Hey, it’s worth a shot, right? Natural healers have used gemstones for ages for healing mental and physical ailments. If you’re not into the bracelet thing, I suggest you find something like this that works for you. 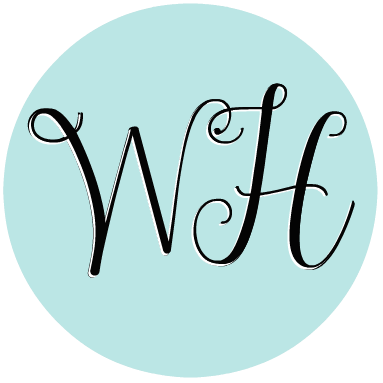 Write daily note card reminders and keep them in your car, kitchen and bathroom. Draw something on your hand. Think of something you’ll always see or feel. Today focus on love. Love is a choice. It doesn’t always come naturally, it often is not the easy way. Most of the time, the cost is to put your wants and needs on the back burner. Making loving choices can bring a substantial change in your life and your relationships. In my opinion, daily prayer must be part of your life to help you with this daily choice. Ask the Holy Spirit to fill your life, soul, mind, heart and home so your initial reactions will be unconditional love. The entire goal of this process is to respond with love. To talk with a loving voice and in a loving manner. Often times, it’s our voice and the way we say things, as opposed to what we say, that is our attitude. A tude in the voice is very harmful to relationships and will always lead to a fight or negative feelings. Focus today on a loving voice, all day, no matter the circumstance. To be content means to be satisfied to the point where you are not disturbed or disquieted. It should be our goal to be content no matter our surroundings or situation. That is true peace and happiness. 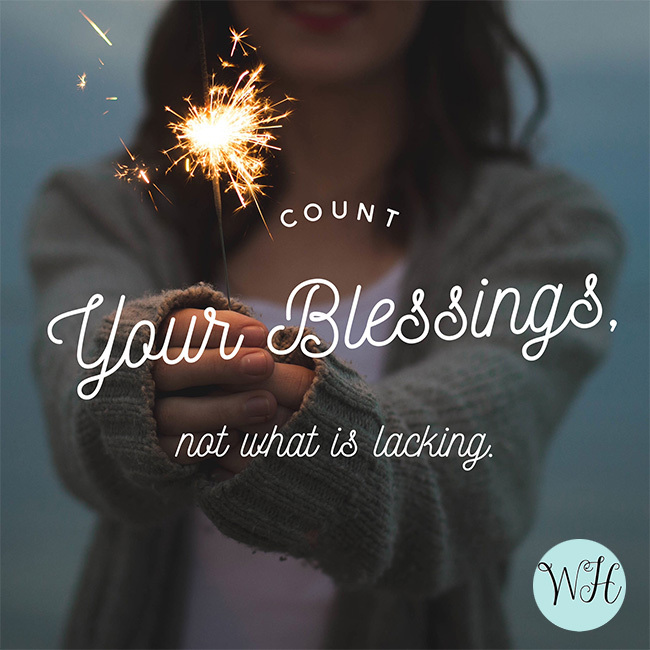 Count your blessings, NOT what is lacking. Refocus your energy on the good in your life, not the bad. It was once my job to walk into a kitchen and inspect it for safety. In other words, I had to look through the good to see the bad. Now, my brain must be re-wired to see the opposite. If you’re a boss, manager or supervisor, I’m certain you have some responsibilities that require you do the same. Why am I facing these challenges? What are these struggles trying to teach me? Go back to each struggle and write down why they exist. Be honest with yourself, no one will read this, so be real with yourself. If you tend to play the victim role, this may be difficult for you. Just shift the blame from others back to yourself to find the answer. I kept seeing the same reasons: I needed to live life for another, to put others first. All my challenges were there to allow me opportunity to do so. They were also there to practice all forms of love – patience, kindness, humbleness, respect, slowness to anger. When you know why things occur and what the lesson is that needs to be learned, you will succeed. We don’t need to BE LOVED, we need someone TO LOVE. Life has no meaning without love. But what exactly is love? Surprisingly, it’s not the way we “feel” towards someone. Love is how we act toward them; completely opposite to what our culture leads us to believe. Love, as explained earlier, isn’t always easy and typically comes at a cost. We all fail daily to love others; it involves complete selflessness. That is why God is the ultimate love, it requires perfection. But remember, God forgives every time. Daily prayer: Make me a blessing to others everywhere I go. Let them see you in me. What is a soul? Your soul makes up your mind, your will and your emotions. It’s based on thoughts and attitudes and it determines how we live. When people say, “follow your heart,” I think what they really mean to say is, “listen to your soul”. When we’re at peace, difficult situations won’t trouble our soul. 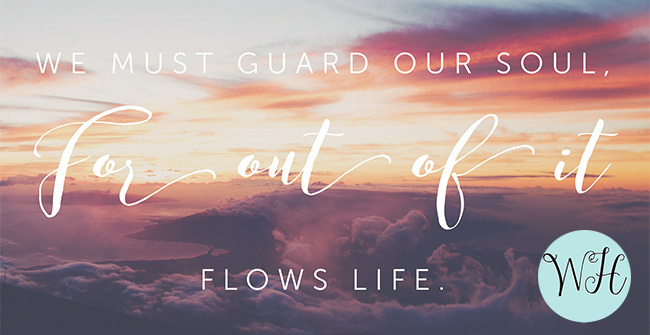 We must guard our soul, for out of it flows life. Take some time to listen to your soul. If you’ve never “gotten in touch” with it, now’s the time. Many who practice meditation and/or yoga focus on the “inner being” and merging body and mind. Quieting the mind and coming to know the soul are why these practices are so effective at stress relief and boosting morale. My sister once said to me that she finds joy in deep cleaning her house because when she’s done, she knows she did the best job she could have done. It was cleaned by giving her all. Small tasks and big tasks can be fulfilling if your mindset is altered a bit. Focus on the task at hand and do it well. This is why gardening, cleaning, organizing and doing other “mindless” jobs can be healing and therapeutic. Today, relax and become simple. Focus on disallowing overwhelming feelings from overtaking you by focusing on small tasks. Be thankful you have a place to clean; thankful you can move freely without chronic pain or a wheelchair. There are a millions thanks we can give in a day, we just need to recognize them. Living in the past causes depression. Living in the future causes anxiety. Living in the present enables you to make healthy, sane choices to foster your emotional well-being. Make a choice today to be positive. When you’re positive, you have FAITH; faith that you are not in control of this world and that it’s okay. Today could be your last day here on Earth, don’t let it be a depressed, pitty party, full of negativity. Live today as if it is a gift – because it is. Each minute you are still here and breathing is a gift of life that will one day be taken away. Live life slower. Eat slower. Drive slower. React slower. Take life in. This will allow you to be more in control. Goal: Honor God with a positive mind. After all, he gave you your mind and your life; it’s the least you can do. Life is all about whom is in it, not what is in it. Friends are sometimes family, and sometimes not. Whomever they are, let them know how valuable they are to you. Imagine your life without them; this always helps me realize how appreciative I am for their presence in my life. Write down who it is and why they are so special to you. LISTEN. Try not to give advice-based solutions. Insights and feedback, of course is always welcome. Why? Everyone has the answer in them. It’s our job to help them identify it. Be VULNERABLE. Thank them. Apologize. Tell them how much they mean to you. Don’t go overboard, but sprinkle them with compliments and loving words. It’s our job to build them up. Prayer: Thank you for my friends who are family, my friends in the past, my friends today and my future friends. Allow me to be the friend they need me to be. 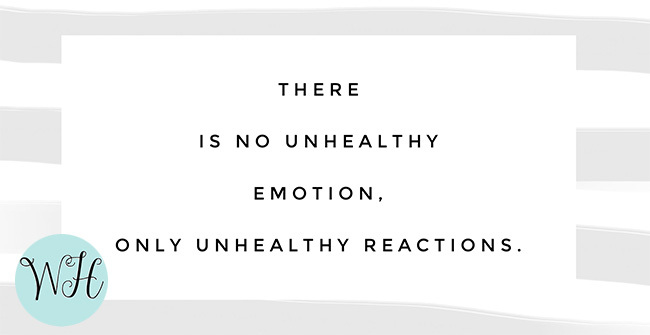 There is no unhealthy emotion, only unhealthy reactions. Stop. Just stop. The heat of the moment is a terrible place to bring up any issue. Leave if you need to. DO NOT ADDRESS ANY ISSUE when angered (more specifically, when your heart rate is up or you feel overwhelmed with emotion). By the way, this is my hardest challenge. Think. Why did I get angry? Break it down and talk about it calmly, later. Later. Implement the 24-hour rule. The 24-hour rule is something you should consider implementing in your relationships, especially if you often find yourself bickering over “nothing”. Like mentioned earlier in day 3, I had once read a recommendation to wait 3 days before bringing up an issue. I chose to modify this idea to the “24-hour rule”. Here’s how it works. You can let them know you’re upset, but NOT right away. You have to wait 24 hours. The purpose of this is to limit volatility and promote more patience. If it doesn’t bother you after a day passes, forget it. Likely, the majority of the things you’d typically bring up (and fight about) will be avoided. And if just one fight is avoided, then I would consider this method a success. Goal: Limit your bickering and fighting. Practice taking it on the chin. This is a practice of unconditional love. This day is exclusive to love relationships between women and men. If you’re attitude is not related to a problem between your significant other, feel free to revisit another day in lieu of this one. In relationships men and women have different responsibilities. When these responsibilities are not met, or worse, lines are crossed, problems arise. See how you and your significant other fare when it comes to this. These responsibilities are according to scripture. If you’re finding that you aren’t holding up your side of the bargan, work on it before pointing out your partner’s shortfalls. Criticism is an evil thing. It is extraordinarily harmful to those you are criticizing. Plus, it’s also harmful to you! When we tear others down it certainly does not do anything positive within us. As negativity leaves our mouth, it tarnishes our heart and soul. So how do you stop criticizing? Stop, think and choose your attitude before anything. Speak your mind through your heart. Pretend you’re on camera, always. Only say things you’d want to be broadcasted. Today, focus on being positive towards everyone, even if they bother you. Find joy in overcoming yourself. You will have an internal game, so root for good. Think of it as winning with yourself as opposed to letting others get away with something (you think is) dumb. Your daily actions and reactions shape who you are as a person. As much as we try not to judge others, it is impossible. Everyone is labeled by someone else. Make it your goal to not give anyone the opportunity to say something bad about you. Grace is an undeserved gift. God has offered you forgiveness by grace. The least we can do is pay it forward. Give the ones in your life grace. Give them a free pass when they act up. Forgive them when they don’t deserve it. People will hurt you (especially the ones closest). Don’t let those walls come up! Remember the incredible gift offered to you and grace will freely follow. Make it a new mission in your life to be a blessing to someone, daily. If you impact one person each day, that adds up to a huge difference in the world. And yes, while you are making someone else feel good, it also changes you for the better too! While you are practicing this, focus on your own blessings. Weekly, write down your blessings during your quiet time in the morning. List who you’re thankful for and what you’re happy with. HOPE thrives in an atmosphere of thankfulness. Build others up and openly express affection. These are two easy ways to be a blessing to others on a daily basis. Soon, you will do this without thinking and that is a true transformation. After the fix, I felt a need to compose an even more comprehensive program to help those struggling, like me, with fixing their attitude. But I knew for lasting change, Christ needed to be a central player in the game. I will share with you here the synopsis and contents of The Attitude Antidote: A Whole Life Overhaul 21-Day Devotional so you can see how it has the ability to be completely transformative in fixing a bad attitude. Well, you’ve reached the 21st day! I truly hope that this process has helped re-shift your focus and attitude. If you remember nothing else, just try to , “live life for another” and speak the truth in love. Shifting focus from yourself to putting others first, will make you a happier person. 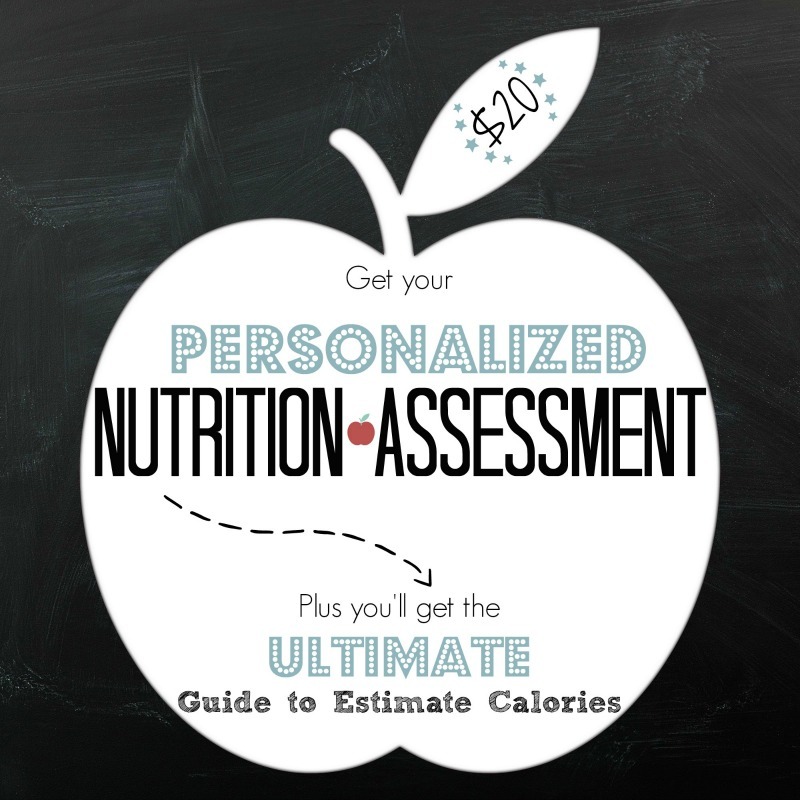 I’d love to hear of your process and outcomes if you’ve completed this program. Please leave a comment, as others would be blessed and inspired by your experience! And please, don’t forget to continue your journey with The Attitude Antidote: A Whole Life Overhaul 21-Day Devotional. What a great contribution to healthy living. I have been encouraging the baby boomers to take on the challenge of fit, not fat for their aging years. Attitudinal change is a major issue, and probably the biggest hurdle. You have spelled out a very helpful strategy that I will be passing. Well thank you so much for your comment, Graham. I am hopeful it may assist change in other’s lives! Thank you.. This was everything I needed in my life. Yours is the most meaningful comment I’ve ever received. Thank you. I love ur way to make it possible . M starting it from today..i ll catch u on 25 december. Good luck, wishing you the best! thanks a lot ma’am……i am 13 actually gonna be 14 very soon…..i usually surf bout controlling anger,ego and attitude . evyone says tht i’ve changed in someway bt even im nt able to understand in wht way i’ve changed nd evyone comments bout my negative side ….the most important thing which evyone triggered me bout was my attitude…..i am really moved by your way of thinking as it is somewht lyk mine…im frankly gonna print this article and gonna maintain a journal during my holidays…. I’m really happy to have connected with you. Just have hope knowing that if you’re working on it, you are moving in the right direction. All the best to you. I have a attitude problem that’ starting to ruin my relationship with my boyfriend. I felt so lost about how to fix my attitude problem but i found this and i am glad. Thank you so much for creating this!! Oh I wish you the best of luck! The best thing to do is to try to always be mindful of your tone. It’s great you’re taking action! I have had an attitude problem all my life. I have always known it’s been a problem, but as I’ve grown older I have realized just how much of a problem it really is. This article helped me step back and take a good look at myself and my attitude. I look forward to starting this 21 Day Attitude Fix. The natural healing bracelets are interesting and I think it would be the perfect daily reminder to myself while on this journey. Could you tell me where you bought your bracelets from? It’s wonderful to hear of your realization! I purchased them on Amazon, if you click on the links under day 8 it should bring you to the listings that I purchased. I wish you the very best! Thank you so much for the message it has blessed and transformed me inwardly . It’s the right message at the right moment to the right person . I’ll be a blessing to many . Be blessed . I am without words. Thank you for sharing. Blessings! I’m extremely excited I came across this article. I need much help and am overwhelmed to have found this. Question, is it possible to have the daily ruetin emailed individually? Hi! I am hoping this exercise will work to create positive change in your life. Unfortunately, I am unable to send that on a daily basis, but you can certainly bookmark for ease of review! 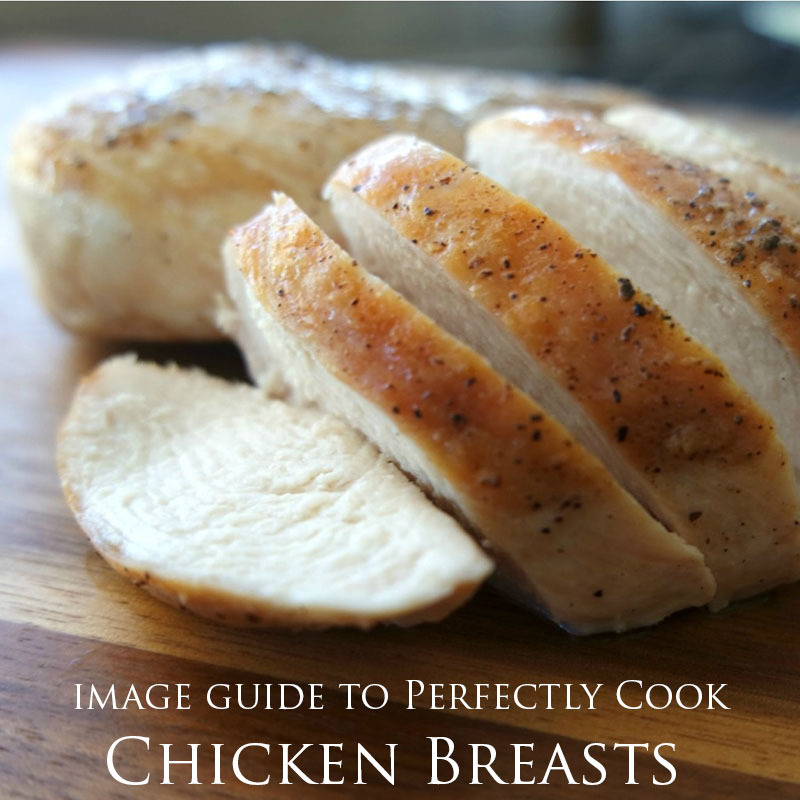 I just bookmarked this page. What an amazing article! Really made me look at myself critically in order to fix what I need to fix. Thank you so much. Thank you so much for commenting, I am so happy to have helped!! Thanks a lot, Jessa Nowak, you covered everything, much more appreciated…! Absolutely! I urge you to sign up for the email list, as there will be a book on this topic coming out by summer! Wow, that is interesting, Sure will do so. Thanks Dear…..! Thank you for taking the time to create this activity! Today was the 21st day for me. I can say that my attitude has improved a lot from day 1. What I found that really helped me was reading 3 chapters of my KJV Bible every morning with my cup of coffee, then after I was finished reading I would write down the day I was on for your program and I would free write. Sometimes I would write to God to help me with my problems, other times I would simply thank him. This program is so simple and so helpful. Now I will have more “me time” in the morning but i will definitely miss this! That is SO amazing to hear! Thank you so much for sharing this! I have a devotional that is focused on attitude coming out in the next two weeks that I’m sure you’d love! I’ll send info out to the email list, so be sure to sign up! How exactly do i do this? Do i need to practice it everyday after i wake up early in the morning? Do i pretty much imagine? Sorry i didn’t finish reading it because i got confused but i am really looking forward on doing this. I am more than tired to have a bad attitude, i hurt others so much and no matter how much i noticed it, i can’t seem to do anything about it. I push people i LOVE away, i cause so much pain to myself and people around me and it’s not fun at all. It gets really hard… I’ve been thinking on going to like therapy to help me too. Yes, I would do this each morning to set your day with a positive intention. It is hard at first, but you will see positive results quickly! Good luck. I’m 23 years old and just lost a 10 year relationship with my best friend, just yesterday, because of my bad attitude. What hurt me the most is that she didn’t come to me this time about the issue, instead she was talking about me behind my back. She said she couldn’t take it anymore. However after losing the one person that was closet to me, I cant afford to lose anyone else in my life. I’ve had this attitude for my whole life, it’s improved but I guess not fast enough. I thought to myself maybe I need to go to a doctor or maybe see a psychologist…before I’d take it that far, I figured to just google “How can I fix my bad attitude?” and I came across your articles. I look forward to starting this 21 day challenge and hope it impacts me greatly. I loved this article and thought you would too. Here it is 21-Day Attitude Fix located at http://www.inwealthandhealth.com/21-day-attitude-fix/.